At The Fig Cooking School, we know that nothing creates stronger ties among friends, family, or colleagues than time spent in the kitchen. That’s why we’ve pioneered a team-building program grounded in the family tradition of cooking and breaking bread together. Read on to learn more about our team building events, or click the links below to jump to a section! Overview | Customizing Your Experience | Sample Menus | The Fig Advantage | Happy Clients | Amenities | Start Planning! With an exclusive range of menus specifically tailored to our corporate clients, we will work with you to create a bespoke event, customized to your team’s needs. Our teaching kitchen, conveniently located in Milford, CT, can accommodate up to 45 guests, and features space for corporate presentations as well. We love doing everything from client appreciation, to team bonding, to holiday parties. Every guest heads home with a detailed recipe pack, and you can even enhance the experience with gift packs, ensuring that your team will cherish memories of your event for years to come. In addition to many local businesses and doctor's offices, our happy clients have included Wolfgang Puck Catering, 3M, FedEx, Schick-Wilkinson Sword, Thule and Alexion. To set up your event and inquire about pricing please call 203.288.4142 or email heide@figcookingschool.com. Beyond the hands-on, interactive experience offered in all of our cooking classes classes, our team building events are specially formulated to bring your team closer together. When your team arrives, we start by going around the room and sharing fun food facts about ourselves (“What’s your death row meal?” “Favorite flavor of ice cream?”). Then, we begin cooking together, to allow the whole team to bond. Once we’ve prepared most of the meal as a large group, you have the option to pick a menu item to throw in some friendly competition! We’ve listed some of our favorite offerings below. All menus and challenges are fully customizable to the needs and wishes of your group. Elote, Mexican Street Corn, from a recent team building event with Medtronic’s QA Engineers! We pitted the boys (left) against the girls (right) for an afternoon of laughs and friendly competition. Can you guess who won? Our most popular team-building activity, and our personal favorite by far, is the Mystery Box. Your team is divided into smaller groups, and given a base recipe, with a table of ingredients at their disposal. Teams plan their masterpieces, and then work together to execute their creations. Each team is assigned a staff member to give as much or little guidance as you desire, to ensure that this activity is fun for all skill levels. When time is up, teams throw down their utensils and await the final verdict. Creations are judged on creativity, presentation, and (most importantly) flavor. Members of the winning team go home with tokens of their victory, and everybody gets to enjoy the results of their hard work along with the final meal. Examples of past Mystery Box challenges include French-inspired flatbreads, cookies, and Mexican street corn. Inspired by the charming favorite TV series, The Great British Bake-Off (also known as The Great British Baking Show) we divide your team into groups and give them identical recipes to follow. With all the necessary materials laid out in front of them, your team works together to read the recipe carefully and make sure no important instructions are missed. Facing a reasonable, but firm, time limit, teams must delegate and trust in their teammates to carry each other to victory. Our staff will be on hand to oversee and provide hints, but ultimately it is up to your team to support each other as they interpret and execute the perfect recipe. When time is up, our staff will grade the finished product on flavor, presentation, and how close the final creation came to the intended outcome. As in all of our challenges, the winning team will receive specially chosen prizes, and all participants will be rewarded with enjoying the creations of all teams, and deciding for themselves which they like the best! Sea salt-chocolate chip cookies from a recent technical challenge with a local orthodontist’s office! Once we’ve finished cooking, your team gathers around our marble communal table to enjoy the meal you have just prepared. We wrap up by going around the room and sharing what we have learned. Every aspect of your event, from the challenges to the menu, to the amount of hands-on cooking is fully customizable to your team’s wishes. Get in touch with us today to start planning your event! 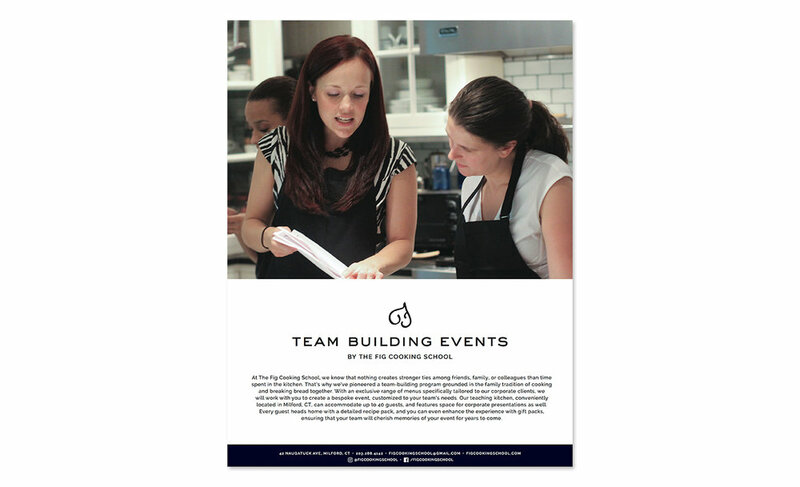 We offer over 70 menus and can adapt virtually anything we do to a team building event. Here are some favorites that we’ve enjoyed sharing recently! All classes are taught using our hands-on method. Hands-on learning engages your team, facilitates interaction among teammates, and makes the learning process dynamic and fun. Note: Our learning kitchen also has abundant seating for guests who are more comfortable watching. Classes are relevant to all skill levels. Every guest, regardless of their kitchen comfort-level coming in, will feel welcomed and engaged. Experienced cooks and culinary newbies alike will learn together and come away with valuable tools for the kitchen and the workplace. Your event will cap off with an unforgettable team meal. Breaking bread together is a proven way to put your team at ease and encourage bonding over great food and conversation. We set aside abundant time in every class for guests to relax and get to know each other better over the meal they have prepared. Every team member works together to make the final meal. Your employees will experience tangible results from working together, and, at the end, will literally eat the fruits of their labor. Guests go home with recipes and, optionally, team building-exclusive souvenirs. A tangible memento of their time spent in the Fig kitchen will ensure that your employees will relive their experience for years to come. Our classes are located in Milford, CT’s beautiful Walnut Beach. Not only is our Walnut Beach location, one block from the water, incredibly therapeutic and picturesque, but it is convenient to all of Fairfield and New Haven Counties, and a short drive from Central CT and Westchester. When we designed the Fig kitchen, we did it with your event in mind! From presentation space to location, we have everything you need for a short event or a full-day retreat. Here are some of the amenities and advantages of our spectacular space! Our team building events range in size from 10-45 guests, and can be fully customized to the needs of large or small groups. Our kitchen is uniquely formatted with both a residential-style and a commercial setup side-by-side, allowing for full flexibility and customization in how we cook together. Our full setup includes two stoves (12 burners total), four ovens, two fridges, an industrial freezer, one commercial griddle, and more. When you choose to host an event at Fig, you can rest assured knowing that EVERY aspect of your event is taken care of. We have more ingredients and utensils than you can ever imagine, aprons for your team to wear (also available to purchase as party favors! ), professional-level knives and stunning dish-ware. All you need to bring is your team! From our Wolf Stoves and Ovens to our Victorinox Chef’s Knives, our Vitamix Blender, our many Le Creuset Dutch Ovens, our Peugeot Pepper Grinder, and our signature Marble-and-Copper Bar, our kitchen is outfitted with nothing but the quality your team deserves. Located in Milford, CT we are convenient to all of Fairfield and New Haven Counties, and a short drive from Central CT and Westchester. Whether your office is based in Branford or Stamford, we’re an easy trip for everyone on your team. Located just one block from the beach, we are located in the heart of Milford’s Art District, surrounded by neighbors like Artfish 42, Walnut Beach Wellness, and the famous Walnut Beach Creamery. Many teams choose to spend time at the beach before or after their event, to take advantage of the beautiful views and therapeutic fresh air. Set up with communal marble tables and a presentation screen (see below), our space is set up to accommodate presenters or meetings. Our tables can be moved together to create a roundtable setup, or moved to the side to create an audience setup for larger groups. Our presentation space is outfitted with a smart TV, complete with AirPlay, making presentations a breeze. The TV itself can be swiveled to face any part of the room. If compatible technology is a concern, we have an in-house computer and iPad that can be connected to the screen for presentations. Feel free to let us know your specific technology needs so we can ensure our space is set up in advance to meet your requirements. Beginning November 2018, we are thrilled to announce that we will begin offering wine, beer, and cocktail pairings to enjoy with your meal. Allow us to make recommendations, or work with us to customize a drink menu based on your team’s wishes. Please note that per insurance regulations, and to ensure full participation in your event, we cannot serve any alcohol until we are ready to eat. In addition to bringing home a packet with all recipes from the class, you have the option to add on party favors for your team to take home. Options range from t-shirts, to aprons, to sea salt, to utensils and more. If you wish to add a party favor onto your experience, please discuss it with us as soon as possible so we can ensure supply, as some items may need to be special ordered. Reach out to us here to begin planning your event! Please include as many details as you know so we can provide you with the best options for your team. We look forward to cooking with you!